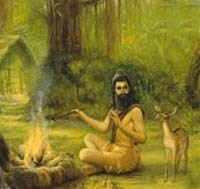 Vedic Yajna (Yajgya or sacrifice or ritual) is performed for the prosperity of human race through peaceful co-existence with nature by energizing the various forces in nature – especially sun. Agni (fire) represents Sun, the Prathyaksha Brahman or Visible God, in Sanatana Dharma, and it is worshipped during the Yajna. This vedic ritual is known as Athirathram and is one of the world’s oldest surviving ritual.